Changi Airport is a bustling air hub with much to offer. As the manager and operator of the airport, Changi Airport Group (CAG) ensures that passengers are provided with first-class services with unrivalled capabilities. This is why all who leave the grounds of Changi are able to speak in awe of the Changi Experience. With over 70,000 square metres of commercial space, the airport has also become a favourite haunt for Singapore residents and families – regardless of whether they are travelling. CAG Local Undergraduate Scholar Amanda Thng is contributing to this phenomenon. As Senior Associate at the Airside Concessions division, Amanda reviews current retail offerings to identify the most relevant fit for passengers, and works closely with retailers to offer a diverse retail mix. She tells us, "As I am still new to my role, I need to work on my awareness and understanding of the retail market. This will help me position the airport leasing opportunities to our retail operators. It certainly helped to have an extremely supportive supervisor and team – by watching my supervisor in action, I was able to learn how to build rapport with our retail partners." During her tenure, she learnt how to analyse historical flight statistics, evaluate the current performance of existing flight sectors and make recommendations for several new sectors. She muses, "These internship experiences gave me a preview of how different divisions operate and enabled me to familiarise myself with CAG's operations. When I started working, I realised that the experiences gained from my internships really helped to accelerate my learning." Amanda hopes to rotate to other divisions within CAG to gain a more holistic understanding of airport operations. 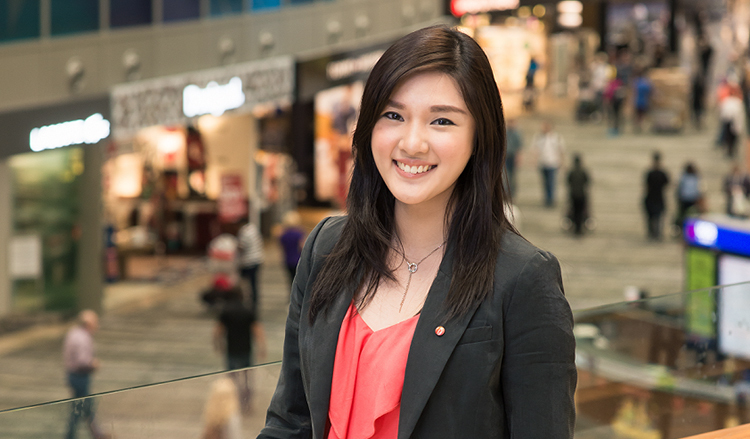 She tells us, "I want to learn more about the different facets of airport management. I was thus really glad to learn that CAG provides opportunities to try different areas of work. I am grateful to be in an organisation that takes such a keen interest in the development of its employees." She feels motivated being part of a company that is constantly innovating to stay ahead and pushing its boundaries. "With many development projects in the pipeline such as the new Terminal 4, Project Jewel and Changi East, I am excited to see how the Changi Experience will evolve," she enthuses. Amanda shares that her daily work experience is unparalleled and unique. "There are many opportunities to make a difference to CAG's throngs of passengers who passes through our gates. I go to work each day feeling excited and inspired, and I am privileged to be part of a team that dares to dream big. Quite literally, the sky is the limit for Changi Airport."